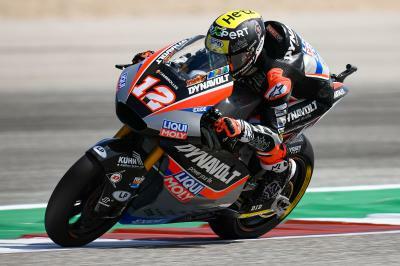 Dynavolt Intact GP’s Marcel Schrötter made a statement in the final session of day one at the Red Bull Grand Prix of the Americas by moving half a second clear of his teammate Thomas Lüthi in the Moto2™ class. 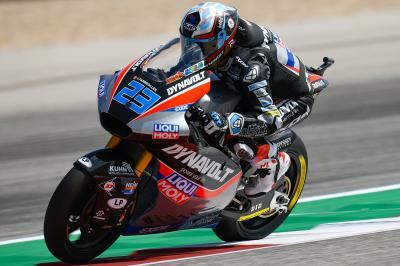 Possibly more impressively, the German’s time of 2:09.982 meant he was within 0.034 seconds of Franco Morbidelli’s COTA lap record from 2017, plus he was half a second quicker than the lap Alex Marquez (EG 0,0 Marc VDS) set to earn pole position last year. 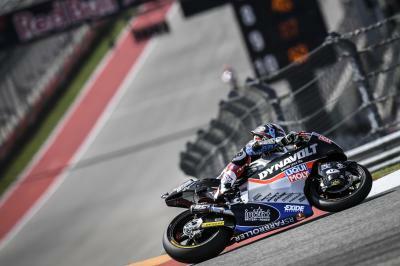 In a carbon copy of FP1, it's a Dynavolt 1-2 with @MarcelSchrotter topping the session from teammate @ThomasLUTHI! ???? Despite everyone going quicker than in FP1, it was again the Dynavolt Intact GP squad that held the top two places thanks to Tom Lüthi. Just 0.090 of a second behind Lüthi was Marquez, who managed to find over a second from FP1 to comfortably put him inside the Q2 cut off. 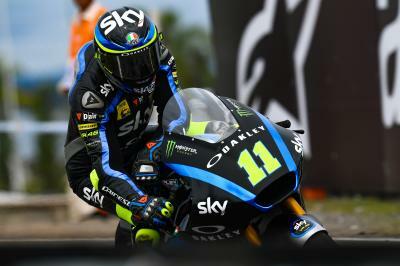 Sky Racing Team VR46’s Luca Marini was less than a tenth behind Lüthi but the dominance of Schrötter means the Italian is over six tenths off of the pace setter. 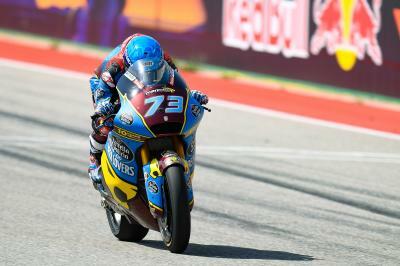 Federal Oil Gresini Moto2’s Sam Lowes completed the top five. Sixth quickest, having improved from 14th in this morning’s FP1, was the championship leader Lorenzo Baldassarri (Flexbox HP 40). 0.058 of a second behind the Qatar and Argentina race winner was rookie Fabio Di Giannantonio (Beta Tools Speed Up), who climbed from 16th in FP1 to finish day one seventh. 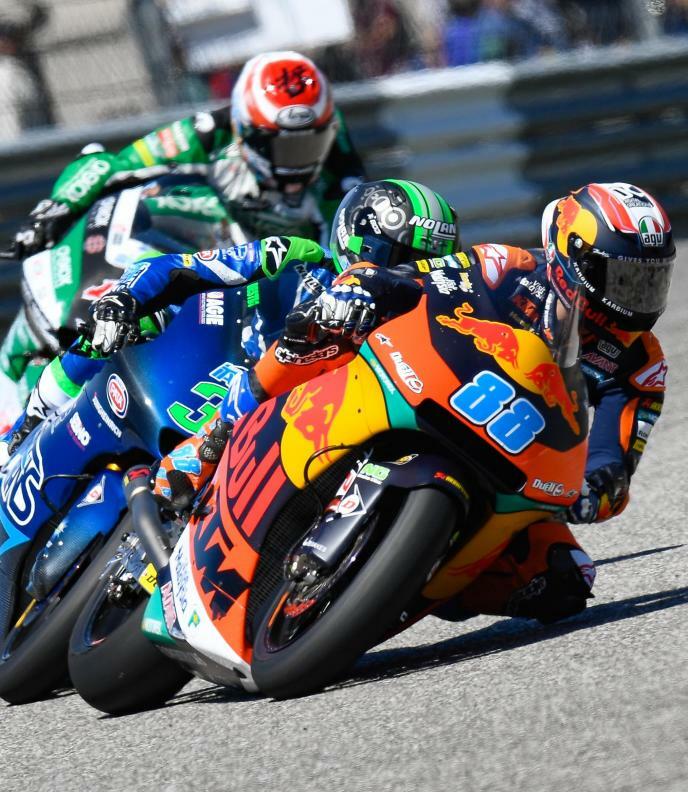 On his return to the Moto2™ class, Flexbox HP 40’s Mattia Pasini was eighth quickest just ahead of Jorge Navarro (Beta Tools Speed Up), who slipped from the top three in FP1, and Remy Gardner (ONEXOX TKKR SAG Team). Gardner’s teammate, Tetsuta Nagashima, was another of the big improvers having leaped from 23rd in FP1 to provisionaly hold a Q2 spot in eleventh place. On course to join the Japanese rider in Q2 are Andrea Locatelli (Italtrans Racing Team), Simone Corsi (Tasca Racing Scuderia Moto2) and Enea Bastianini (Italtrans Racing Team). Following a spectacular crash on the bump into Turn 2, leaving him unhurt, Xavi Vierge of EG 0,0 Marc VDS is currently 18th overall meaning Argentina’s poleman looks like he might have to fight out of Q1 tomorrow. Petronas Sprinta Racing’s Khairul Idham Pawi had a big highside on the exitof Turn 6 in the closing stages of the session and was sent to the medical centre as a result for further checks but declared fit. 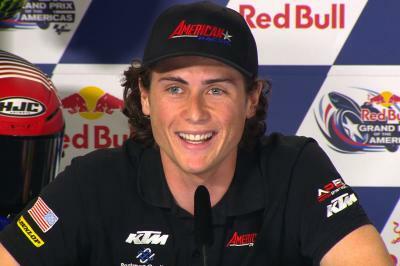 Roberts: "Nicky was one of my greatest heroes"